We’d love your help. Let us know what’s wrong with this preview of The Heart-Shaped Life Daily Devotional by Karen Moore. To ask other readers questions about The Heart-Shaped Life Daily Devotional, please sign up. This is a wonderful devotion book. I am a devotion book addict and this one is quite good. Of course, I haven't read the entire book, because it lasts a year, but the devotions I have read so far are wonderful. "What if God inspired you to walk 'heart first' into every life event and circumstance, no matter what it was?" "What if love was your number one priority? Love of God, love of others and love of yourself?" We all sometimes fall short in the love department. Folks get on our nerves, we don' This is a wonderful devotion book. I am a devotion book addict and this one is quite good. Of course, I haven't read the entire book, because it lasts a year, but the devotions I have read so far are wonderful. We all sometimes fall short in the love department. Folks get on our nerves, we don't like the way they do things, and react accordingly. Maybe not to them, but certainly in our hearts. What if, just what if, we treated others as we wanted Jesus to treat us? And furthermore, what if we *thought* about others as we wanted Jesus to think about us? Pretty deep, isn't it? I know I want to achieve that and I fail often. While we are in the flesh, we will fail, but this little devotion book will help us to keep that love for Christ, others and ourselves forefront in our minds and help us better achieve that goal. I look forward to the next year reading these selections. I have not finished reading The Heart-Shaped Life, but I have enjoyed it very much so far. This is beautiful, hardback, and full of high-quality gloss pages. Every page is a devotion specific to each day of the year. I have found this book to be a beautiful love centered reflection of God and His will for our lives. While I have never before ready anything by Karen Moore, I am now very interested in getting my hands on one of her other books. This would make a good gift for yourself or a loved o I have not finished reading The Heart-Shaped Life, but I have enjoyed it very much so far. This is beautiful, hardback, and full of high-quality gloss pages. Every page is a devotion specific to each day of the year. I have found this book to be a beautiful love centered reflection of God and His will for our lives. While I have never before ready anything by Karen Moore, I am now very interested in getting my hands on one of her other books. This would make a good gift for yourself or a loved one. The author has written a book about love and how God fits into our lives and our hearts. Each devotional begins with a scripture, has a devotional thought, and ends with a short prayer. The colors of both the cover and the interior are beautiful and eye-catching. There is a ribbon bookmark as well. The days are numbered, but include a February 29 so the book can be used any year. The back of the book includes a scripture index for all of the texts used in the devotional. I read through the devot The author has written a book about love and how God fits into our lives and our hearts. Each devotional begins with a scripture, has a devotional thought, and ends with a short prayer. The colors of both the cover and the interior are beautiful and eye-catching. There is a ribbon bookmark as well. The days are numbered, but include a February 29 so the book can be used any year. The back of the book includes a scripture index for all of the texts used in the devotional. I read through the devotions and thought the author did a great job of creating thought provoking snippets that can be read quickly for the busy individual, but leave the reader contemplating them throughout the day. They are relevant and inspiring. 1. apply to the Scripture given. 2. 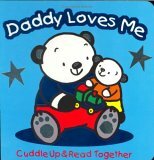 Is heartfelt and very thought out like the author truly wants you to know GOD's heart in the little time you have. Usually devotionals are short but sweet and to the point and generic and similar to each other and some are hit and runs if you know what I mean - This devotional is the total opposite of all those devotionals you have read - it is unreal - it gets you thinking and feeling - ya'll know what I mean - Amen? This is so much fun to read - you will love this devotional. I received a complimentary copy of this book from the Publisher and NetGalley; all the opinions in this review are all my own. When I first saw this devotional, I thought it was for women. It has that look. However, after looking through it and reading several of the daily devotionals in it, I can say it is for men and women both. This IS a 365 day devotional, plus it has one for Leap Year, February 29. Each day has a title, followed by a Scripture verse, then the actual devotional, and ending with a short prayer. An aside: I like the looks of each page, a lot of red and blue. Each devotional is centered around love in When I first saw this devotional, I thought it was for women. It has that look. However, after looking through it and reading several of the daily devotionals in it, I can say it is for men and women both. Each devotional is centered around love in some sort of day, and the author does a great job of getting a whole year out of that one topic..... but it is something we need. This book inspired me many mornings during my quiet time. I hated coming to the end. I may start over from the beginning , now in 2019. One of my all time favorite devotionals. I really enjoy reading the passages in this devotional. They are an excellent was to start my day. There is a devotion for ever day of the year including February 29th which I loved. So many devotionals leave that day out unless published in a leap year. The format of each devotion is title, verse, devotion then prayer. These are a great way to start your day or pick up at anytime really. You have the verse and reflection to think on throughout the day helping you to stay close to God. Another thing that I liked was the variety of translations, most devotionals stick to one bible translation There is a devotion for ever day of the year including February 29th which I loved. So many devotionals leave that day out unless published in a leap year. The format of each devotion is title, verse, devotion then prayer. These are a great way to start your day or pick up at anytime really. You have the verse and reflection to think on throughout the day helping you to stay close to God. Another thing that I liked was the variety of translations, most devotionals stick to one bible translation throughout which is fine but when it's not your favorite it's a little "meh". Overall it's a really great devotional that I can see myself using regularly. The Heart-Shaped Life Daily Devotional is a beautiful way to start each day with an uplifting thought on living a love-filled life. I hope many will want to read this book since we need more love in this world now. With many trying to survive in this fast paced life, it is refreshing to read something that brings a smile within. This would be a great gift as well as a love-filled message to inspire since that is what happened to me by reading. I received a complimentary copy of this book from Bar The Heart-Shaped Life Daily Devotional is a beautiful way to start each day with an uplifting thought on living a love-filled life. I hope many will want to read this book since we need more love in this world now. With many trying to survive in this fast paced life, it is refreshing to read something that brings a smile within. This is a wonderful daily devotional that is compact in size and has an eye catching, colorful cover. The title is perfect, The Heart - Shaped Life. Each devotional is encouraging and speaks of opening your heart and mind to love, giving and receiving, but mostly giving. There are 365 devotions, one for every day of the year. Each page has a title, relevant scripture, three to four paragraph devotion and ends with a prayer that follows the message of the day. I love that these are not referenced This is a wonderful daily devotional that is compact in size and has an eye catching, colorful cover. The title is perfect, The Heart - Shaped Life. Each devotional is encouraging and speaks of opening your heart and mind to love, giving and receiving, but mostly giving. There are 365 devotions, one for every day of the year. Each page has a title, relevant scripture, three to four paragraph devotion and ends with a prayer that follows the message of the day. I love that these are not referenced with a year so that they may be used again and again or given as gifts any month or year. There's an attached ribbon to help keep your place for quick daily reads. It's a great way for me to start my busy day, with my heart on the Lord so that no matter what I might face I'll be prepared. This is perfect for anyone that thinks they don't have time in the mornings to honor God. A great day starter that only takes a couple of minutes and if you are like me, some of the words will sink in during the day and come to mind over and over. I received an ARC of this devotional from Netgalley. This is my unbiased review. I thoroughly enjoyed the devotions in this book. I truly love this devotional. It has become a great addition to my daily Bible reading. Each day's devotion is only one page, so I am not overwhelmed with a lot of reading. There is a verse, a devotion and an ending prayer....perfect. I highly recommend this devotional. 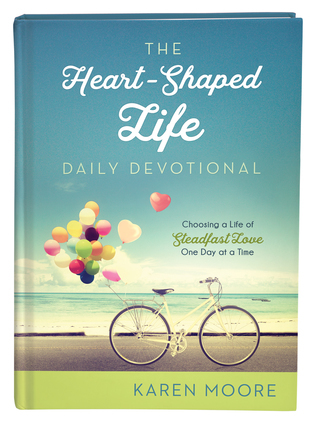 I love The Heart-Shaped Life Daily Devotional. It is an attractive book that captures your attention immediately. It is hard back and has an attached ribbon that helps you keep your place. Each day you are challenged by Moore to live a more heartfelt life. You open each day with a scripture verse then a devotion that relates to that verse. Then you end each page with a prayer. I have found it be inspiring and I feel like anyone who reads it will be blessed. Great gift too! I love! love! love! devotionals. Especially when they are as easy to read and concise as these are. The one-page, dated daily devotions (yay for alliteration) begin with a Scripture verse, continue with a few paragraphs of nourishment, and close with a thoughtful prayer. The conversational tone delivers wonderful affirmations of love and prompts us to live life fully. The Heart-Shaped Life, by Karen Moore, is simply an energizing, inspiring and refreshing way to start your day. We all need encoura I love! love! love! devotionals. Especially when they are as easy to read and concise as these are. The Heart-Shaped Life, by Karen Moore, is simply an energizing, inspiring and refreshing way to start your day. We all need encouragement and guidance, and I can’t think of a better way to set out on your day – than to start it in devotion and prayer to our Lord. *This thick, hardback book is loaded with words of wisdom for your daily worship throughout the year, and comes with an attached satin ribbon bookmark. What a great devotional that reminds us daily to keep our hearts right and pliable before God. When we harden our hearts and shut God out He is still there waiting. This is a wonderful way to start your day or even to end your day and only takes a few moments of your time. It has a title, scripture, a few paragraphs of reflection, and a short prayer. Also is an attached ribbon bookmark and it is so pretty on my end table. Let love of God, others, and yourself be a part of your daily life. I recei What a great devotional that reminds us daily to keep our hearts right and pliable before God. When we harden our hearts and shut God out He is still there waiting. This is a wonderful way to start your day or even to end your day and only takes a few moments of your time. It has a title, scripture, a few paragraphs of reflection, and a short prayer. Also is an attached ribbon bookmark and it is so pretty on my end table. Let love of God, others, and yourself be a part of your daily life. A truly inspirational devotional. Uplifting and encouraging on every page. This is a great book to give as a gift. I received a complimentary copy of this book from Barbour Publishing and was under no obligation to post a review. I have to say that the hardback devotional is very beautiful and of a high quality. The pages are even a high quality thicker glossy paper. The devotional includes a ribbon page marker. So just a first glance you will be impressed with this book. In fact, it would be an ideal gift for a gift for friend, secret sister, bible study pal, pastor's wife etc. Additionally, this is a devotional for an entire year. There is a reading for all 366 days (yes it includes a reading for leap day). And each de I have to say that the hardback devotional is very beautiful and of a high quality. The pages are even a high quality thicker glossy paper. The devotional includes a ribbon page marker. So just a first glance you will be impressed with this book. In fact, it would be an ideal gift for a gift for friend, secret sister, bible study pal, pastor's wife etc. Additionally, this is a devotional for an entire year. There is a reading for all 366 days (yes it includes a reading for leap day). And each devotional is inspiring, challenging and practical. This is one page of reading per day which includes a Bible verse for the day, a short reading that expounds on the Bible Verse, and ends with a prayer for the day. The reading is sometimes an explanation of the verse, sometimes a story to go along with the verse and sometimes a practical challenge for the day. I love the variety of the readings personally, so that it is not the same every day. Highly recommend this book for yourself, or to gift to another. I'm personally going to purchase 2 of these for my 2 prayer sisters to give them on Mother's Day as I don't want to give up my personal copy. Now just to whet your appetite I'm going to share just some excerpts of a couple of my favorites. The Patient Heart based on Proverbs 14:29 "There is a fine line between understanding and folly. The old adage that patience is a virtue come to mind here. The reason patience is a virtue is that we recognize we don't seem to have it programmed into us. We like things to happen quickly.......go back and consider the moments when you're not even able to be patient with yourself......May your heart be guided and gently shaped by patience in every task you undertake today." The Oil of Joy based on Hebrews 1:9 "God can work with your heart when it's warm and pliable. He can help shape your thinking and reshape your plans. He can give you a vision of joy and purpose.....The beauty of oils is that they work quickly, are absorbed by your skin, and gently make their way through your system....Lord thank you for filling me with the oil of your loving Spirit. Help me to share the joy and the blessing you've given me today to make a positive difference in others." Last teaser, Do good today based on I Thessalonians 5:13-15 includes a quiz to test yourself on very real scenarios and how well you would be able to stay calm in this situations. And I'll be honest these scenarios challenged my heart. So you don't want to miss out on this devotional. I can say this is one of those books that will stay on the shelf close my reading chair and I will do a reading each day year after year as it is that good. And as I read through these to preview this book, every reading left me feeling challenged, refreshed and inspired to start my day with the Lord. A good book to inspire one to live the life with love as a priority. The Heart-Shaped Life is a daily devotional book with a devotional for everyday of the year with excellent challenges to face each day with love. I like Karen Moore’s refreshing thoughts in the book, the scriptures included and her prayer for the day. I recommend this book to anyone looking for a good devotional book. I received a complimentary copy of this book from Barbour Publishing and was under no obligation to post a review. Karen Moore's The Heart Shaped Life is a daily devotional that will provide much more than a few moments of encouragement with its daily readings. Reading this book feels like you're talking with a friend rather than reading a message from an unknown author. Her daily notes will uplift your spirits, touch your heart where you need it most, even provide just the words you need to hear. just when you need to hear it. 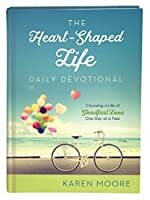 I would recommend this book to anyone as part of their daily devotions and know i Karen Moore's The Heart Shaped Life is a daily devotional that will provide much more than a few moments of encouragement with its daily readings. Reading this book feels like you're talking with a friend rather than reading a message from an unknown author. Her daily notes will uplift your spirits, touch your heart where you need it most, even provide just the words you need to hear. just when you need to hear it. I would recommend this book to anyone as part of their daily devotions and know it will become an encouragement to you for many years to come. The Scripture references are always relevant, and the message following seems like it was written just for you. In fact, I expect there will be days when you want to keep reading, and perhaps find yourself into next month before you know it. The Heart-Shaped Life daily devotional by Karen Moore is a beautiful, inspiring book. Each day, dated for the entire year, begins with a scripture verse or two, continues with a one-page homily and ends with a short prayer of application. The devotionals are easily applicable to one's daily life and are focused on subjects of the heart and spirit. "Create in me the desire to be a more loving person in faithful service to You." "You are a part of God's way for making the world a better place." "I The Heart-Shaped Life daily devotional by Karen Moore is a beautiful, inspiring book. Each day, dated for the entire year, begins with a scripture verse or two, continues with a one-page homily and ends with a short prayer of application. The devotionals are easily applicable to one's daily life and are focused on subjects of the heart and spirit. "Create in me the desire to be a more loving person in faithful service to You." "You are a part of God's way for making the world a better place." "If your heart is broken...go back to the Source of your strength." With encouraging words like these examples, the author challenges readers to learn to develop a heart that overflows with the life of Christ. A wonderful book to start one's day or to give as a gift. Such a great book for today’s busy woman! Each day’s devotion is only one page in length yet offers a lot to meditate on throughout the day. Offering scripture selections and pray for each day, Author Karen Moore helps the reader to focus on God’s love for Himself, others, and self. Read this book and you’ll be encouraged to see the world through the heart of love. I found this to be a very good daily devotional. The look is very clean and crisp but eye appealing and the book just feels nice in m Such a great book for today’s busy woman! Each day’s devotion is only one page in length yet offers a lot to meditate on throughout the day. Offering scripture selections and pray for each day, Author Karen Moore helps the reader to focus on God’s love for Himself, others, and self. Read this book and you’ll be encouraged to see the world through the heart of love. I found this to be a very good daily devotional. The look is very clean and crisp but eye appealing and the book just feels nice in my hand. In a welcome note at the beginning of this book author Karen Moore suggests that "a little inspiration each day helps to change your perspective and lighten your heart to make life's journey easier." She then offers The Message translation of Proverbs 4:23. "Keep vigilant watch over your heart, that's where life starts." In this new devotional Moore has written 365 entries that relate to our hearts and our attitudes and in each daily entry she shares scripture, her own observation and a prayer. In a welcome note at the beginning of this book author Karen Moore suggests that "a little inspiration each day helps to change your perspective and lighten your heart to make life's journey easier." She then offers The Message translation of Proverbs 4:23. "Keep vigilant watch over your heart, that's where life starts." In this new devotional Moore has written 365 entries that relate to our hearts and our attitudes and in each daily entry she shares scripture, her own observation and a prayer. These daily devotions are short and cover only one page but they are full of inspiration and encouragement. If you prefer an early morning time with God, this will be the perfect way to start your day; others may consider this book to be a wonderful way to prepare for a restful and peaceful night. I enjoy using different devotionals and I especially appreciate that this book has a scripture index that can be helpful if I am reading my Bible and I want to have another person's perspective on a certain verse. I heartily recommend 'The Heart-Shaped Life' for my own personal use but its attractive hard cover makes it also perfect to share as a gift! This devotional has the month and day to be used over and over for each year. A Scripture Index is given in the back of the book for application reference while studying the Bible. You will find it timely for each day as a beginning to your Bible reading. Have your Journal and pen ready to make notations to how it fit into your day. At the end of the year, you will be amazed at the thread of continuance it has been to record your thoughts and prayers. There is a ribbon bookmark to keep your place ~ or, you may even like to jump around as you take it with you during your day for times while waiting for an appointment, or picking up your children. This devo is good for any age. You may enjoy sharing it together around the table. Welcome to a fresh start. . .
. . .not just to the day, but to life! It’s time to energize your spirit and realign your heart so you think more positively and lovingly about every circumstance you encounter. God offers you His kind and generous Spirit so you can stay healthy in heart and mind. He nourishes your soul and shapes your heart so you become more like Jesus. God commanded us to love Him, to make Him a priority, and to do so with the biggest love we can possibly muster. Right after that, He said to love each other, even as much as we love ourselves. Love is what motivates your heart every morning. . .what makes you see the world through His eyes. Rejoice in your loving and generous Creator who knows you and who willingly shapes your heart to live in abundant joy. Offer Him your praise and thanks as your spirit grows stronger, lavished by His love! May God grant your heart’s desires and help you to live a heart-shaped life. Like Bibles, I can never get enough of Daily Devotionals. When this one came up to review, I was super happy. I couldn't wait to get my hands on it. The cover is super eye catching and the devotionals within are just what I need to read. Each day, there is a theme, a bible verse to accompany the theme, a devotional to read and then concludes with a prayer to say. I love that. I feel like my walk with God will improve with this devotional. The devotionals are wonderful and seem to be just what I need to hear/see. Karen Moore is an award-winning writer of more than sixty inspirational and devotional books for all ages. She also works with American Greetings and DaySpring, developing a greeting card line. Moore holds a master's degree in Education, has three grown children, and lives in Florida.